Commonly, companies think that using Direct Backup or Disaster Recovery services is same as buying health insurance. They haven’t feel the importance of the services when the machine still run smoothly until one day a serious problem occurs and it costs even much more expensive to fix it or even lost their revenue. About half from all business in Developed Countries had ever experienced several kind of worse disaster which leads to the dismissal of company’s operation either caused by natural disaster, wrong configuration, hacked, or even lack of infrastructure maintenance. Some electricity outage occurs for few hours, but 80% of the electricity outage occurs for one or more than one day. Even if there is downtime for several hours in a month it can cause a huge lost. For small company, the lost can reach up to 100 million and while big company can reach 9,3 billion. One of the consideration that makes a company hard to use Disaster Recovery service is the additional cost that they will have to spend since they have to pay a high-end softwares. Beside that the common thought that “disaster and failure will never happen in my company” put Disaster Recovery in Company’s lowest priority. One thing that a company should remember is don’t focus on the costs. Let’s focusing on the benefit and the potential lost that your company might experience. Your company should have calculated statistic and the business lost calculation when downtime occurs. So when a power outage or even system failure happens your company has prepared it the backup plan. Another cost constraint is, the thought that data backup recovery is something that easy to get, cheap, or even free, such as Enterprises File Sync and Sharing that you can get it free or cost not more than hundred Rupiah. Comparing with the real Disaster Recovery Solutions that cost up to million Rupiah per month, certainly your company might choose the EFSS Solution. Some important points that your company should remember is, low cost recovery solution commonly doesn’t provide picture based backups, doesn’t backup your mail server, and needs longer time to recover your data. Some company might think that when they use Disaster Recovery Services they need a technician to check the backup system, arrange the virtualization and also backup test and recovery. Now, it is not something that you need to worried about. Full Managed Backup and Recovery Platform will be supported by certified group of technician called Network Operation Center (NOC). Our NOC can help you to relieve your management burden. 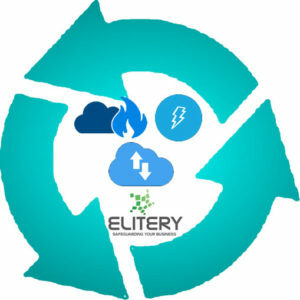 By using Elitery Disaster Recovery as a Services (DRaaS) not only your IT Infrastructure is completely secure but your company will not stop operating even when disaster occurs. We will provide you all the system and DR Managed Service. This system includes your application assessment until its migration. Since 2012 we provide the best Data Center for Disaster Recovery solution, more than 100 companies trusted using our services. Our Data Center Strategically located in 42 km south of Jakarta, ideal for Disaster Recovery Center Site (DRC site). Located in Bogor area, a very safe place for a data center, its 45 minutes drive from Jakarta CBD, and only 10 minutes from Bogor Toll Exit you have an easy access to Jagorawi Toll Road connecting to Jakarta Inner and outer ring Road. With Elitery you don’t have to be afraid of your DR management. We have 24/7 Data Center Operations and Network Operations Center support who will always ready to assist you. Our commitment in 99.982% SLA (based on Uptime Institute Tier III) is one thing that you can always rely on. Feel free to contact us or fill the form below for further disaster recovery services information.